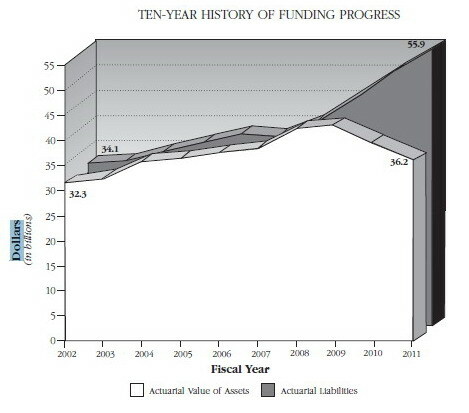 Source: State Retirement and Pension System annual report. Maryland’s $37 billion state retirement and pension system for employees and teachers earned only .36% on its investments in the fiscal year that ended June 30. Most of the asset categories in the fund, from cash to real estate, had positive earnings of 3% to 8%. But publicly traded stocks, which represent 42% of the portfolio, were down almost 7%. The results “look like a minor disaster for fiscal 2011,” said Jeff Hooke, an investment banker who is chairman of the Maryland Tax Education Foundation and a persistent critic of the pension system. Earlier this month the pension system board rejected a proposal to lower its assumed rate of return from 7.75% to 7.5%. All three New York bond rating agencies last week expressed concern about Maryland’s pension liabilities. Fitch Ratings explicitly rejected the notion that 7.75% is realistic and uses the more conservative figure of 7%. This means that instead of state employee and teacher pensions now being funded at about 64%, the system actually had about 60% of the money needed over the next 30 years and that the unfunded liabilities of the plan were not $20 billion but more like $24 billion. The rate of return on investments is crucial because most pension systems gain more money each year from their investments than they get from contributions by employees and the state budget. Some of the states comparable to Maryland have not yet reported results, but California, with the largest state pension system valued at $233 billion, did two weeks ago. It announced “a dismal 1% annual return on its investments, a figure far short of projections that will likely bring pressure on California’s state and local governments to contribute more money,” according to an Associated Press story. California pension officials cited reasons similar to Moye’s for that low performance. 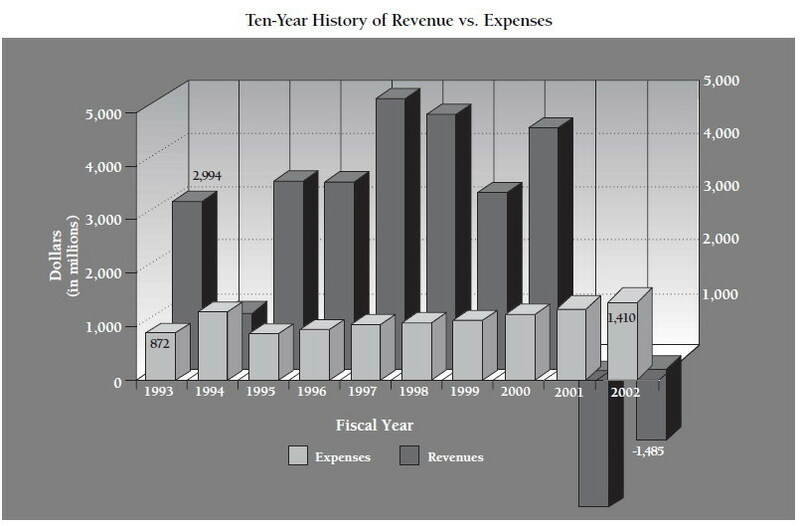 1993-2002 10-year history graph. 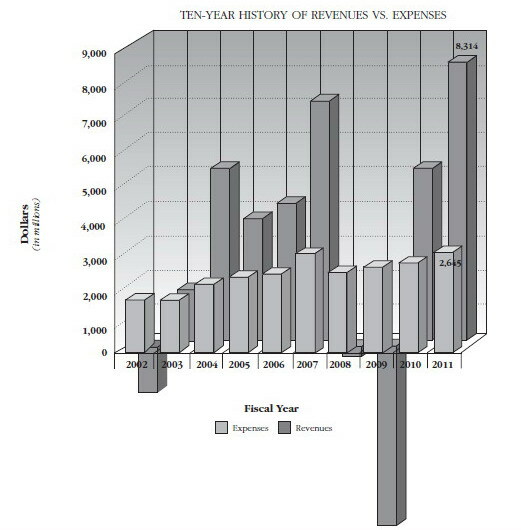 Source: State Retirement and Pension System annual report. 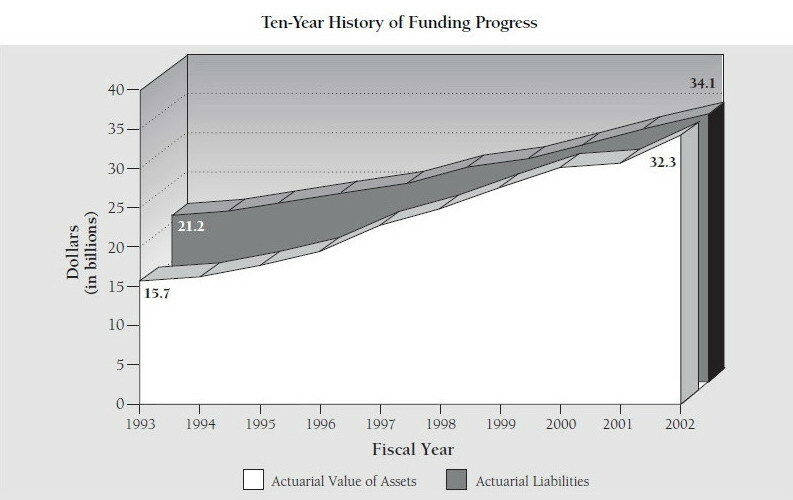 Besides poor investment performance as shown in the accompanying charts, Maryland governors have consistently refused to put in the “actuarially required contribution” to match the pension promises made to employees and teachers. In this year’s budget, legislators told the retirement system to come up with a plan to phase out the “corridor method” of funding that has permitted lower contributions. The system’s board, headed by Kopp, has recommended the “corridor method” be eliminated. Lowering the assumed rate of return and putting in the required contributions would cost hundreds of millions more, money that would likely have to be taken out of ongoing programs.